In this tapestry "Offering of Love" we see the work of Jean-Baptiste Huet (1745-1811), created for the first time towards 1780 at the Royal Manufacture of Beauvais. 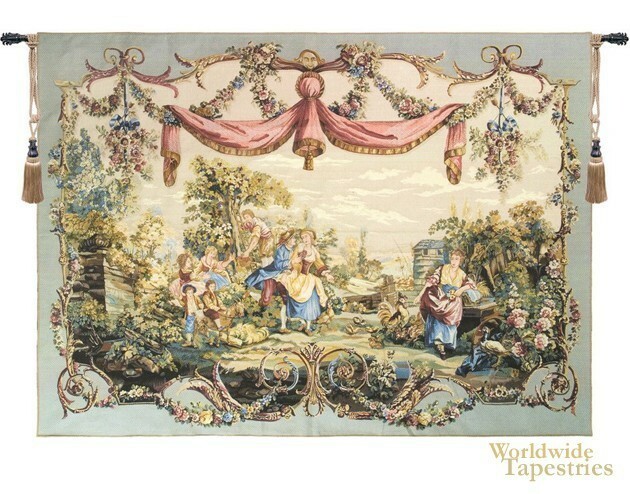 The Beauvais Manufacture was a powerhouse in the production of beautiful tapestries in the 18th century France, and this wall hanging is part of a series of ten wall-hangings called the Tentures Patorales. This series of tapestries is composed of five with red draperies and five with blue draperies. Here we see the villagers enjoying the afternoon among lush flowers and countryside, with some romance, playful children as well as some ladies and men doing some village duties. The border is both ornate and fantasy based to provide a decorative accompaniment. This tapestry "Offering of Love" is backed with lining and a tunnel for easy hanging. Note: tapestry rod and tassels, where pictured, are purchased separately.